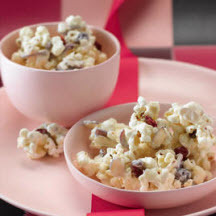 Smooth white chocolate candy studded with dried cranberries, toasted slivered almonds and crispy popcorn. Line a baking pan with foil or wax paper; set aside. For White Chocolate Peppermint Popcorn Crunch: Omit cranberries and almonds. Stir in 1 cup crushed hard candy peppermints after chocolate is melted.